Apple recently released their newest programming language, Swift, as open source. That means that anyone can now use this trending programming language, on any system. Apple has made it easy to get Swift going on Ubuntu, so we’ll show you how! If you haven’t heard of it before, Swift is Apple’s newest programming language intended to replace Objective-C and become the primary language for building Mac OS X and iOS applications. It’s very easy to learn the language as it’s clean and has a similar syntax to other popular programming languages. However, Swift was only available for Apple devices — it could not be run on Windows, Linux, or other systems. With Swift’s increasing popularity, more people were asking that Apple open-source Swift or at least make it available on more platforms. After some time, Apple has finally released Swift as open source. I think this is a good move for Apple, as it allows more people to become exposed to Swift, which in turn allows for more people to write Mac OS X and iOS applications in the future. In any case, if you’re interested in using or learning Swift, it’s now available for Linux! 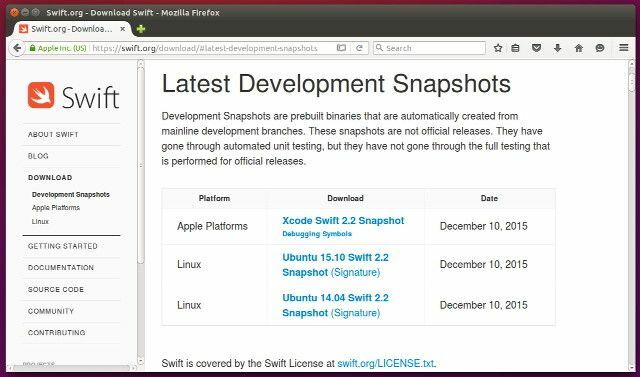 Right now Apple only has released snapshots made for Ubuntu 14.04 and 15.10, but opportunities to install Swift support on other distributions will certainly come in the near future. For now, here’s how to get it going on Ubuntu. First, you’ll need to visit the Swift download page and grab the latest version (at time of writing, there are only development snapshots available — stable releases will come soon, so it’s your choice which of the two you’d like to use). Once it’s downloaded, open the .tar file by double-clicking on it and then extract the folder that lies within to any location of your preference. This will become the location of your Swift installation.